Andrea found this T6 tour - along the Gerstelgrat above the Waldenburg ruins - on hikr.org; it sounded too good to pass up, and the weather was ok, so off we went. The next few hours along the ridge are just pure fun. It varies between more or less normal ridge hiking, very narrow ridge hiking, and scrambling, with a bit of climbing tossed in for good measure. We did much of it with alpine belaying and both of us moving, though there were a few spots where we actually did belaying. 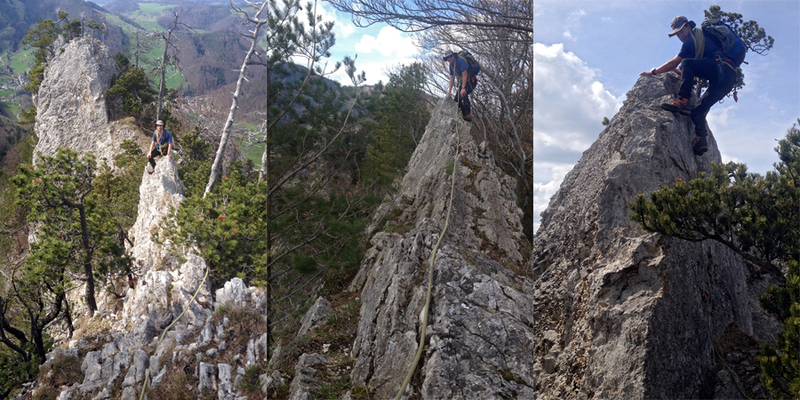 The 20-30m up to the top of the tower in the middle (the Spitzenflüeli, p804 on the map) were actual climbing and we both just climbed down the "hang and drop" spot later in the ridge. Throughout we kept more or less directly on the ridge (Andrea was leading most of the way and seemed to have a spring attaching her to the ridge!). Once up top we took a short lunch break, signed the book, and then continued along the ridge downwards until we hit the path leading down into the valley to the South (no idea the name of this). 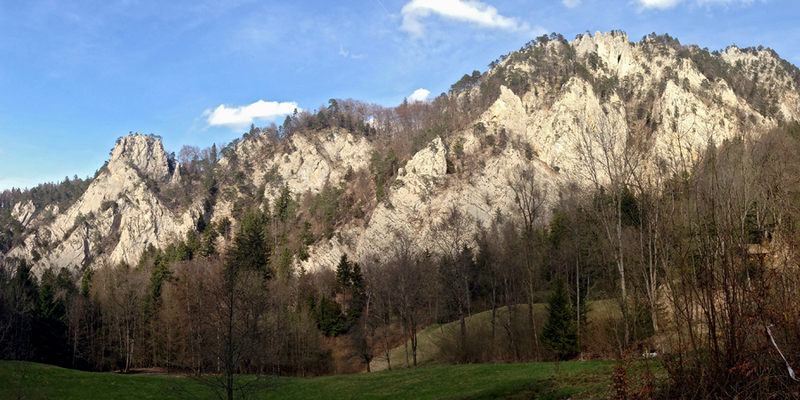 After a bit of bushwhacking we ended up on the forest road along the other side of the valley which we followed, at times with great views of the wall of the Gerstelflue (looks like good, but maybe harder, multi-pitch routes there), back to Waldenburg. Throughout the day we were mostly alone: we saw one pair climbing the other side of the tower, a couple hikers on the normal path between the tower and the next stretch on the ridge, and a group of three on the ridge itself getting ready to abseil down to the Drachenloch.